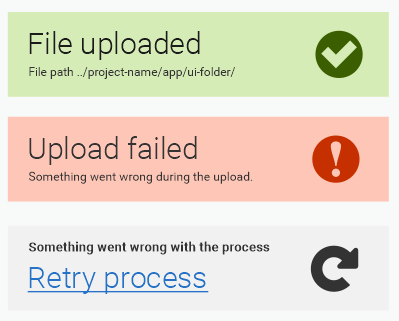 Error/ success messages in web apps. Material design writing style, recommends to be simple and direct. The advice is easy to follow in one-sentence messages. But what about two-sentence messages? What is the best way to write two-sentence messages? File not downloaded. The download was stopped or interrupted by another file download. File was not downloaded. The download was stopped or interrupted by another file download. File not downloaded. Download stopped manually or interrupted by another file download. Problem stated. Explanation of what went wrong or/and what can be done to fix this. What is the best way to formulate those two sentences? 1) the first one as if it's a one-sentence message. the second one following all the grammar rules and in the right tense form. That said, the guidelines recommend "being essential", so think about whether you really always need two sentences. Display two-sentence messages in two sizes. The first thing that comes to my mind is that in the 2 sentence messages you are repeating the message. The download has been interrupted therefore it wasn't downloaded. Tin man is correct re: the formatting. I think that approach is best. However, the copy of the message should be in the active voice as much as possible, avoiding "File was not downloaded." I understand when referring to the cause of the error/ issue, companies don't want to take blame (and apologizing may not be part of the company error message tone/ style), but the more active voice the better. Your file didn't download. OR File didn't download. Also, error messages should include some indication of a solve or a way to contact/ message someone for help whenever possible. Not the answer you're looking for? Browse other questions tagged error-message copywriting popup messages grammar or ask your own question. Leave data in form after submission? Enable Button Only to Give an Error? Or Show a Mysterious Disabled Button?